Women who work as conductors and clerks in Nairobi’s informal matatu industry came together last week to strengthen women’s leadership in responding to bus rapid transport (BRT). 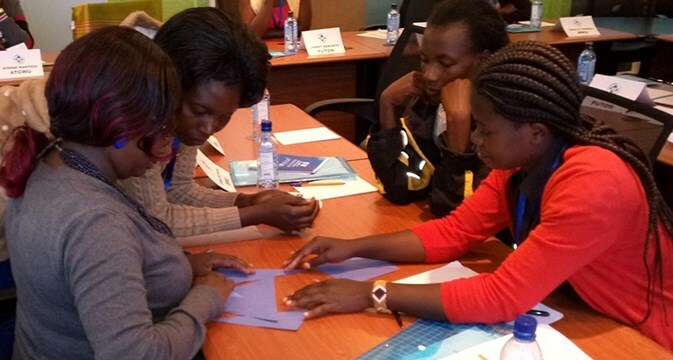 The ITF women’s leadership training workshop, from 4-6 October, brought together 15 women from two ITF unions – PUTON (Public Transport Operators Union) and MWU (Matatu Workers’ Union). Also participating were a representative from the ATGWU in Uganda – which is a mentor union in the ITF’s Our Public Transport Nairobi project – and from the FLONE initiative, an NGO that supports women in public transport. Shared their experiences of the issues they face at work – in particular, sexual assault and harassment; lack of respect and discrimination; and harassment, by the police, local ‘askaris’ (authorities), colleagues and passengers. Learnt about BRT and the proposed new BRT system in Nairobi. Explored the importance of building alliances for women’s empowerment, including what alliances are and how to develop them. Engaged in sessions on leadership skills, and the barriers to recruiting and organising informal sector women workers into trade unions. Learnt about the ITF, and how it is co-ordinating affiliate action to tackle the challenges for women transport workers globally, to improve working lives for women transport workers and build women’s activism. Shared the ITF’s informal workers charter and viewed the film. The participants also developed an action plan relating to gender aspects for inclusion in the ITF’s work on Nairobi’s BRT system. The workshop was held as part of the ITF’s priority Our Public Transport programme, which actively campaigns for public transport based on public ownership, public investment, secure jobs and union rights for workers in public and private employers. Read more. Read the new ITF booklet on organising informal workers. It is also available in French and Spanish. Read more about the ITF’s work on violence against women at the campaign page and the blog. Engage with the debate on social media using #VAW.